Gros Morne National Park is a world heritage site on the west coast of Newfoundland. It is the second-largest national park in Canada (surpassed by Torngat Mountains National Park) and takes its name from the province’s second-highest mountain peak, which stands some 2,644 feet tall. Gros Morne, meaning “large mountain standing alone,” is a member of the Long Range Mountains, an outlying range of Appalachian Mountains which stretches the length of the island’s west coast. The mountain range itself formed around 1.2 billion years ago, and the park provides an extremely rare example of the process of continental drift, where deep ocean crust and the rocks of the Earth’s mantle lie exposed. Gros Morne National Park Reserve was established in 1973 and made a national park in 2005. Since its opening, hundreds of thousands of people have visited the pristine piece of Canadian wilderness, taking advantage of its hiking, walking, boating, and camping opportunities. A UNESCO World Heritage Site covering around 1122 square miles, the park is a seemingly never-ending series of stunning vistas. Filled with towering cliffs and thunderous waterfalls, Gros Morne National Park is the perfect backdrop for nearly every type of outdoor activity. With soaring fjords, moody mountains, diverse beaches, and limitless bogs, forests, and cliffs, Gros Morne also offers the unique opportunity to hike into the alpine highlands a spot Arctic hare and ptarmigan in the tundra. The park’s attractions, however, do not begin and end with natural beauty. Nearby seaside communities are proud of their rich, indigenous cultures, providing visitors an opportunity to learn about the region’s native peoples. From theaters and festivals to restaurants and boutiques, the communities surrounding Gros Morne National Park provide a different type of education. Despite its relatively remote location, Gros Morne National Park is surprisingly accessible. Major airlines fly into multiple airports around the area, are regional airlines service smaller, more accessible airports. Flights from Halifax are only around an hour, while flights from Montreal are just around three hours long. If you’re planning to drive, you can take the ferry from Nova Scotia to either Port aux Basques or Argentia, and several ferries travel along routes between the island and Labrador. Vancouver, located in British Columbia, is a coastal seaport city in western Canada. It is the most populous city in the province; the 2016 census recoded 631,486 people in the city. The Greater Vancouver area has a population of around 2.5 million, making it the third-largest metropolitan area in Canada. The city is consistently named as one of the top five worldwide cities for livability and quality of life, ranking first among the top ten for five consecutive years. Vancouver is home to hundreds of arts and culture outlets. From the Arts Club Theatre Company to Bard on the Beach, theater-lovers are bound to enjoy this stunning city. Similarly, the Vancouver International Film Center is one of the best in the world. The Vancouver Public Library’s main branch at Library Square was designed by world-renowned architect Moshe Safdie and holds 1.5 million volumes. The Vancouver Art Gallery has a permanent collection of nearly 10,000 items and is home to a significant number of works by Emily Carr. Additionally, the Vancouver Symphony Orchestra performs year-round, and the city itself is home to a number of famous Canadian composers. Vancouver also has a large LGBTQ+ community, hosting one of the country’s largest annual LGBTQ+ pride parades. In addition to being a thriving metropolis, Vancouver is also meant to be experienced outdoors. The city’s temperate climate and abundance of rain create an incredible abundance of lush, green outdoor spaces. The largest among them is Stanley Park, a 1,001-acre public park that is almost entirely surrounded by the waters of Vancouver Harbor and English Bay. Adventure lovers will enjoy the Capilano Suspension Bridge, which sits 230 feet above Capilano River. Vancouver is also remarkably accessible to visitors. Their rapid transit network is convenient and inexpensive, and Vancouver International Airport provides a gateway to the greater British Columbia area. Toronto, the capital of the Canadian province of Ontario, is the most populated city in the country. One of North America’s largest cities, Toronto offers several unique districts—a Chinatown, Little India, and Little Italy. The city is one of the world’s most culturally diverse cities, housing more than 200 ethnic groups who speak close to 140 different languages. Moreover, Toronto houses one of the world’s tallest freestanding towers: the CN tower, which stands at 1,815 feet. In addition to impressive landmarks and a culturally-rich history, outdoor lovers will delight in the availability of beaches and walking opportunities. The Toronto Islands, just a short ferry ride away from the main city, are the only islands in this section of Lake Ontario. Few vehicles are permitted, making this an excellent place for swimming, kayaking, biking, and Frisbee golf. A 1900s-style amusement park (for children) sits at the center of the largest island and includes a miniature railway and antique carousel. Not in the mood for outdoor recreation? This city has you covered. From the Royal Ontario Museum’s natural history exhibits to Casa Loma’s towering peaks, there is never a shortage of activity in Toronto. Perfect for a quick weekend getaway, a week-long family trip, or a months-long work- or school-related stay, Toronto has it all. 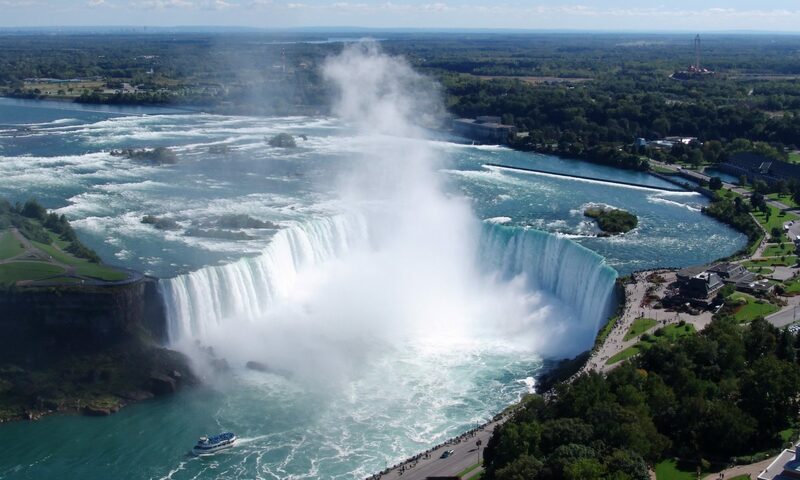 Most (likely all) Americans are familiar with Niagara Falls—a series of three waterfalls situated on the boarder between Canada’s Ontario and America’s New York. The Canadian side of Niagara Falls I known as Horseshoe Falls, and it offers some of the best views and the most attractions. The surrounding area is teeming with tourist life, full of observation towers, restaurants, souvenir shops, casinos, and several high-rise hotels. In recent decades, Niagara Falls has been known as a romantic spot, a cheesy location, and a tourist trap. Now, the area is a felicitous combination of the three—in addition to stunning views of the natural landscape, there are several wineries, distilleries, a botanical garden, and a slew of quickie, pop-up wedding chapels and hotels. In becoming a tacky destination, the Canadian section of Niagara Falls has itself become an interesting piece of tourism and history. With water speeds of up to 68mph, the sound of the falls can be heard for miles around. Whether you want to experience a typical family vacation, a romantic honeymoon, or an ethnographic study of American/Canadian tourism, this is a wonderful place to visit. Though the capital of the Canada’s Quebec province, Quebec City’s appearance is more like that of a French village. Perched on a hill overlooking the St. Lawrence River, this French-speaking and French-looking city is equipped with a booming financial district, cobblestone streets of an Old City, and more than 400 years of history. It has been ranked the #1 best place to visit in Canada, the 1# best ski destination, and the #1 best place to visit during the month of December. Old Quebec (Vieux-Québec) is the only old city north of Mexico to have remaining fortified city walls. The area was declared a World Heritage Site by UNESCO in 1985, and it remains one of the city’s best-known attractions. Similarly, the Chateau Frontenac dominates Quebec City’s skyline; the “most photographed hotel in North America,” this was previously the residence of the British colonial governors of Lower Canada and Quebec. Visitors do not need to be guests of the hotel to take a tour of its most stunning rooms. Art fans will delight in Quebec City’s offerings—home to the Musée national des beaux-arts de Québec (the National Museum of Fine Arts of Quebec) and the Musée de la civilisation (Museum of Civilization), there is no shortage of cultural icons and relics. Though you do not need to speak French to pay a visit to this charming city, it is a wonderful opportunity for language immersion; though most Quebec City residents speak English, French is the primary language. Quebec City is an excellent alternative to an expensive trip to Paris. Visitors will inevitably save money on flights, lodging, and food, while maintaining comfort in the ability to speak English in all public settings.